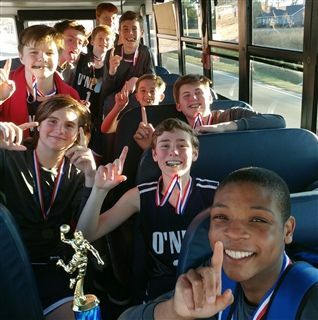 O'Neal's middle school boys basketball team started conference play-off week with a commanding win at home in the semi-final round verses Liberty Christian School with a final score of 61-19. The Falcons hit the road to face-off against Fayetteville Christian, for the SEMSAC Conference finals, who handed the Falcons their only conference loss for the season. The team came out ready to play and eager to redeem themselves. They did not disappoint. The Falcons were victorious taking home the SEMSAC Conference trophy with a final score of 57-36. Way to go Falcons! We are so proud of the hard work, effort, and perseverance you have put in throughout the season!